In contrast with the Second Intifada, which began with a deliberate provocation when Ariel Sharon and 1000 Israeli police officers marched on to the Haram al-Sharif/Temple Mount in September 2000, the First Intifada began almost by chance. On December 8, 1987, an IDF truck crashed into a line of cars stuck at the Erez crossing between Israel and Gaza, killing four Palestinians. This was probably an accident, notwithstanding a pervasive Palestinian belief that it had been an intentional Israeli attack. A demonstration that broke out at the funerals, that evening, turned into mass PLO-led protests throughout Gaza, the West Bank, and East Jerusalem the next day, and that turned into nearly four years of violence. Over 2200 people lost their lives, more than 2000 of them Palestinians. Of course, if you know anything about the history of the Israeli occupation and the Palestinian struggle for self-determination, you know that the First Intifada (the word, intifada, means “shaking” or “awakening,” although now it has come to mean “popular uprising”) didn’t start because of a car accident. That accident was the spark, but the kindling was laid over decades, back to the creation of Israeli in 1948 and more immediately to the Six Day War in 1967, when Israel occupied the West Bank, Gaza, and the Golan. The occupation shut Palestinians out of all but the most menial jobs, and the combination of strict Israeli restrictions on new Palestinian construction and the beginnings of the Jewish settler movement pushed the Palestinians into ever tighter, denser living space. Israeli authorities maintained their control over the Occupied Territories with a combination of violence, intimidation, fear, and pervasive surveillance, adding to a general Palestinian feeling of powerlessness and national humiliation. Large-scale Palestinian demonstrations and isolated acts of violent resistance against the occupation had already begun well before the First Intifada started, and one of the typical Israeli responses to these actions–deportation–fueled Palestinian speculation that the Israeli government was planning to ethnically cleanse the territories so that it could annex the land completely. The Intifada was unprecedented both for the size and scope of the uprising and for the fact that Israel’s usual tactics for suppressing Palestinian protest–police brutality, collective punishment like home demolition, deportations, curfews, etc.–had little effect apart from deepening Palestinian resolve. The one thing that did prove effective was the Israeli effort to cultivate informants and collaborators among the Palestinian population. The informants didn’t provide much information to Israeli authorities, but their presence did generate mistrust and infighting among the Palestinians. 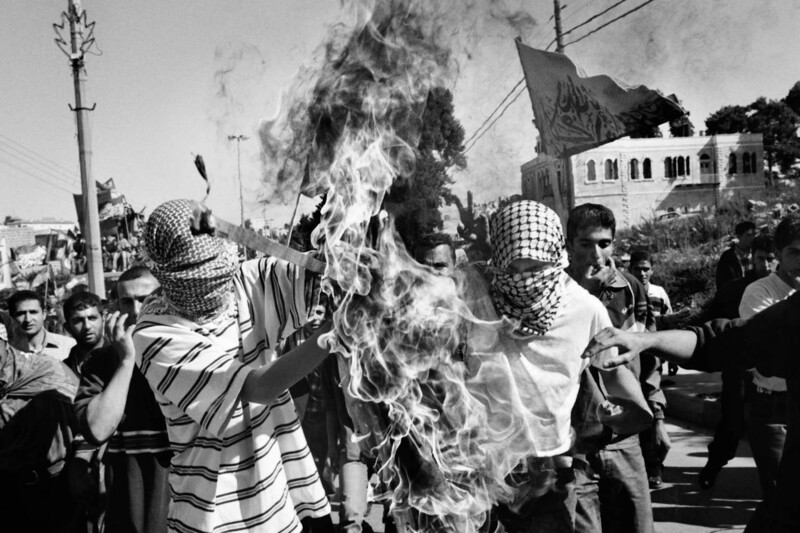 Of the 2000+ Palestinians who died as a result of the Intifada, over 800 of them were killed by their fellow Palestinians, and this internal discord eventually took a lot of the steam out of the uprising. The uprising ended with the opening of an Israel-Palestine peace conference in Madrid on October 30, 1991, although some people will argue that it continued through the signing of the Oslo Accords in 1993. Given how little has actually changed for the Palestinians since 1987, except insofar as things have gotten worse, it’s hard to argue that the uprising achieved anything of significance. However, it did bring global attention to the Palestinian struggle, and it clearly established the PLO as the closest thing the Palestinians had to a political leadership. PLO leader Yasser Arafat used that prestige as political capital in order to get away with moderating the PLO’s position on several key points, like the acceptance of Israel’s right to exist and of the two-state solution as the ultimate goal of peace talks. Those concessions helped create the conditions for the Oslo Accords, and even though we now realize that Oslo was doomed to fail almost from the start, at the time that seemed like a big deal.